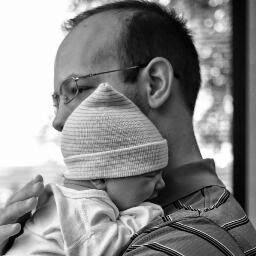 A quick thank you to all who are a part of this website. It has really helped me learn a lot about my home HVAC needs. TLDR: can I get a more accurate heating loss calculation if I know the outside temperature and the coldest temperature a room reaches when the heating system I intend to replace is left off? I actually have three rooms I'd like to get an accurate heat loss calculation for, two of which are directly connected to the rest of the home (no closed doors) and each take on quite a bit of heat from the rest of the home. Example: my kitchen, even when it was -9 over night and I had the heat in that room OFF all night, never dipped below 53 degrees. It seems like there should be a way to use this information to know- given the size of the kitchen- nearly exactly how much heat that room needs. I bought a large (5000 SQ ft) place- originally built in 1890- in Dayton Ohio this past June. I knew my heating bills were going to be "bad" this first winter and I've not been disappointed. Nearly $700 total gas and electric bills in December and January so far. Anticipate ticking just above the $700 mark in February. As one might imagine, with this size and age house there is a lot of room for improvement. This will be a process, and some steps in this process I have identified are air sealing, bringing insulation up to snuff, and replacement of windows (all windows are still original; none can be opened, and rehabbing is not desirable). The biggest thing at this point, though, is to get away from the electrical heat coming on when it gets too cold for the heat pump to be efficient. Which is basically 2/3 or so of the entire winter. I will be adding hot water radiators and/or hot water radiant floor heat to three rooms in my house that currently heat using a heat pump; but it supplements using electrical heat (kitchen, family room, and a rear bedroom) when it gets too cold out. The rest of the house has original hot water radiators and they work great. The heat pump worked great for cooling this past summer BTW, so I don't intend to replace it entirely. You can calculate the heat loss for each room using any parameters you desire for delta T. Just keep in mind that if you precisely size the heat source for the heat loss at a given set of conditions, your inside temps will begin to fall once the delta T exceeds your design assumption. Normally, you design for a reasonable “worst case” outside temperature with an inside temp of 68-70. Typically, the published design outside temps are such that 97.5% of the time the outside temp will be at or above that “design” temperature. However, this also means that 2.5% of the time the temp will be less than this and when that happens, the inside temps will begin to drop below the design inside temperature. So, the equations will take any parameters you feed into them. It all depends on what you wish to accomplish. If you are upgrading the envelope you should base your heat loss on that for sizing the new system. If you plan on keeping the heat pump it may give you some extended use with the tighter envelope. At least until outdoor temps render it ineffective. If you plan on upgrading the heating system before the envelope, but sized for the future envelope upgrades then the heating system would be undersized until the envelope is upgraded. Unless you size it for existing loads then it would be oversized once the envelope is upgraded. You can play with the heat loss program plugging in deifferent scenerios as far as design temps, insulation assemblies, windows, and doors etc. Thanks all. Jamie: now that I think about it I suppose you're right that my idea leaves out things that could have a big impact on how the room cools. For example: the floor is ceramic tile, which I understand has a high heat capacity. And that tile is ICE cold by morning so it's probably elevating the temperature a bit. We have already partially done the envelope (sealed and insulated crawl space) for these rooms, and the attic for one of them has been sealed and insulated (I have four separate attic spaces). I understand I would be undersized until all those changes are complete. The nice thing is, if that became a problem, the heat pump is still there and could be turned on. What I want to accomplish is to expand my hot water heating into these three rooms, and for them to be comfortable on cold days without using the heat pump. And in doing so, not over size the radiators (or underfloor radiant heat runs on the case of the kitchen- there's not a good place to locate a radiator) since large cast iron radiators ain't cheap. I did a Slant Finn calculation for my kitchen and come up with roughly 9,800 BTU/hr (more like 9,000 with a heated floor). That's a lost of radiant heat to buy. My concern is that- given I have observed the temperature doesn't drop much below 50 in the kitchen with NO heat- whether 9,000 is way overkill, since it appears it is being "supplemented" fairly well by all the extra heat coming from the rest of the house. Oversizing emitters is not a bad thing. It allows lower water temps . What’s powering the hot water heating? The existing boiler that runs the rest of the house. When I first started this winter it was set at over 200 degrees my previous owner. I've been experimenting with turning it down lower. We have the typical huge radiators that you find in an old house. So far it seems to continue working fine as low as 160 unless it gets very cold outside. The day a couple weeks ago it was zero the entire day it needed to be turned back up to keep up. However, we haven't replaced the windows OR air sealed the large attic space yet, and that day we had not yet done the crawlspaces. I haven't wanted to go lower than 160 though, I've read too low and you can cause problems with condensing acids in the exhaust or something like that? Currently I'm keeping it at 180. 8,500 for the kitchen (8,000 with heated floor). The other two rooms are 9,500 and 6,500. The 9,500 room could be improved a lot by insulating the brick interiors but there are a number of problems with that, and with 10 ft ceilings with crown moulding and wallpaper..... I'm just not sure I'll ever get around to it. I'm assuming for the kitchen heat loss when you are saying 500 less btus for heated floor you are referring to a floor in the program input that is not over unconditioned space. Not because it is a radiant floor. Remember also if you are planning on doing a radiant floor in the kitchen you have to deduct the unusable SF under cabinets, pantries etc which would not heat the space. Did not know that. But it's still best to install under the entire floor, isn't it? Don't try to go around the cabinets etc? The thing about not dropping below 50 in the kitchen... unless the kitchen is completely isolated from the rest of the house, you are using heat from the rest of the house to help it out. Maybe not all 9,000 BTUh, but some -- while if you had heat in the kitchen, you'd need less heat in the rest of the place. It won't hurt anything unless you heat a cabinet with baskets holding potatoes, and onions . Usually under cabinet, small pantries, under appliances are deleted. It just won't do much to condition the space. Have seen radiant granite counter tops, nice touch. What type of radiant floor? Over the top, or underneath? My point about emitter sizing is IF you plan on swapping out the boiler with a HE boiler down the road. Keeping emitters on the larger side will help the HE boiler be more efficient because you can use lower average water temps. Up grading the envelope effectively does this also to the existing ones since they were sized for a higher heat loss, and you are reducing that. We will eventually tear out the ceramic floor, but not for a while. So it's going to be underneath. Ok so if I'm over sized everywhere else but am "normal" sized in those rooms, I'm setting myself up for potentially weird or inconsistent results in different parts of the house of I try to drastically lower the water temperature down the road. Makes sense. One problem I haven't mentioned: there are other rooms that currently don't have heat at all. The entire rear of the house was on a single pipe steam system that hasn't functioned since at least the late 90s. 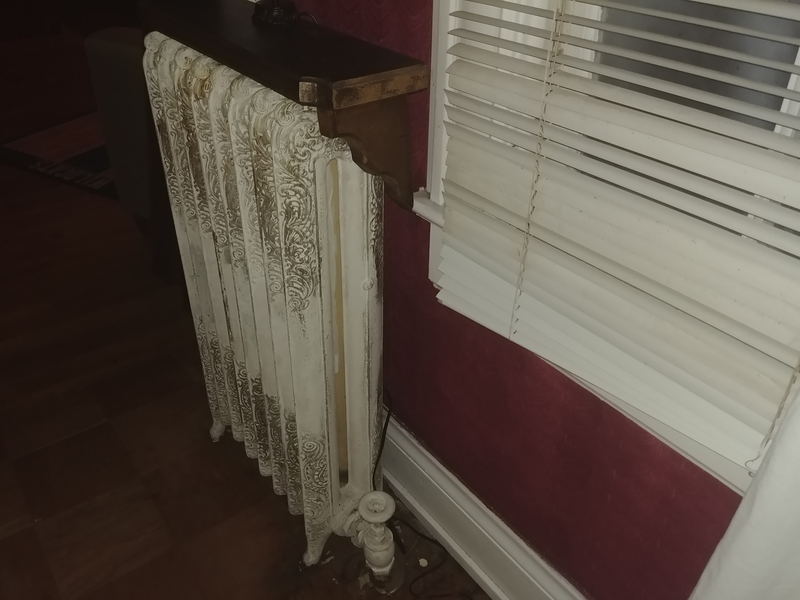 I'm told (by a plumber) these radiators are so old that trying to repurpose them for a two pipe hot water system is good to be damn near impossible, since the fittings are likely seized up and the interior is probably not going to flow too well. So if I have a replace ALL of those with "oversized" units, too..... Man this is going to get expensive. I wouldn't rule out those steam rads without close inspection. Sounds like the plumber is here saying them doa. They can be cleaned, and pressure tested. However a steam rad would have been sized for a higher output temperature being they were steam. So converting to hot water would lower the output due to lower temps used by hot water verses steam. But, You will be upgrading the envelope in those areas? If so they might prove to be sufficient for the load. Would be worth the effort to revive them. One plus is steam rads are empty so the chances of them having damage from freeze being full of water are not likely. Really your scenario is somewhat simple. Do the heat loss using the inputs on what you plan to do to the envelope. Since you have a mix of emitters mostly cast iron rads? You can figure out the equivalent direct radiation "edr " of those rads at a given water temp. In each room. Match the edr btus to the rooms heat loss. 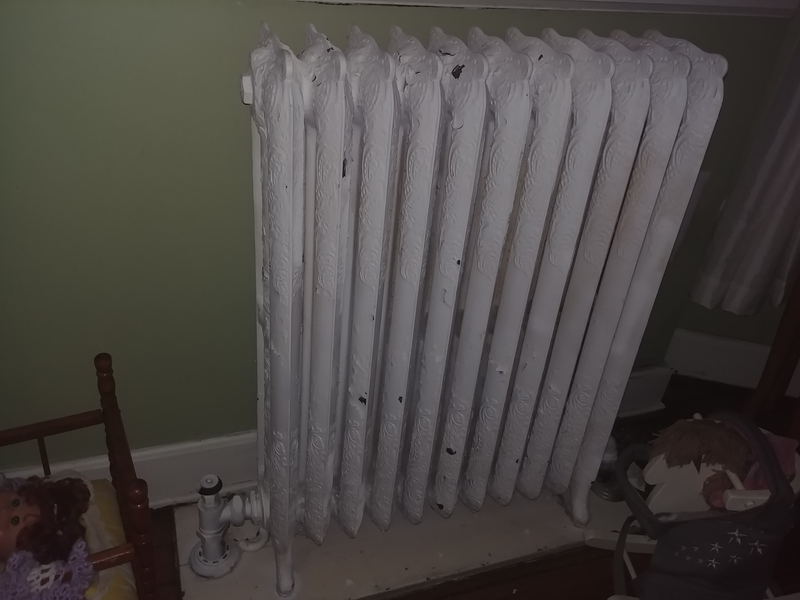 If the radiator is bigger, or more btus than the heat load you'll be able to reduce water temps. The trick here is balance. In other works each rad, and rooms load is similar in output to load. If so you can run the same temp roughly to all the ci rads. The new emitters such as the radiant floor may have to have a lower water temp, but if you are doing under floor radiant it could work out since under floor takes a higher water temp usually than an over the top design. Then any other emitters you are needing to be new maybe say a panel rad, or baseboard you would size to what water temps the rest of the existing rads could use. All this is theoretical possibilities with out crunching the numbers first. So an example would be master bed room rad is 10000 btus at 170* average water temp. The heat loss calcs out to an actual 7000 btus. You know the rad is oversized, and that a lower water temp could be used. Do this for all rooms. If the difference of rad output to the heatloss is relatively similar in each room then you know you could successfully lower the awt to say 150. Now you would size any new emitters to use that same awt. There are books for calculating different style radiator outputs Dan has here on this site. Examples would be identifying the rad if it's fin tube, column etc. than calculate the sf to get the edr. Makes sense! Yes you make a lot of sense. I just counted, I guess it's not as many as I had thought: 7 total steam radiators to be replaced/repurposed in addition to the 3 we've been talking about that will replace the heat pump. They do appear a tad small to me in comparison to the hot waters. Of those 7 radiators only 3 of the rooms stay COLD cold. And they will be greatly improved after we get the main attic space sealed and insulated this summer ish. Any tips on diy figuring out whether the steams are going to be usable? The steams have no connections at the tops (left or right) and the spindels are not connected along the top like the hot waters. There is only flow along the bottom. I don't suppose you've thought about getting steam back to them... but... why not? I was trying to avoid buying a new, second steam boiler (again: current one hasn't been used since the late 90s). And people talk about steam these days like it's bad, somehow. Talk me off the cliff? I guess the first thing to do would be to see if the system would still hold pressure. BTW on the under floor radiant heat: my plan- only in my head for now, open to changes- was to put it on its own separate closed loop, and have it heat to 100 deg (or 90 or whatever makes sense) using a heat exchanger heated by a line to the boiler on its own small pump and stat. I was also hoping to reclaim the space currently occupied by the old steam boiler as a workroom. 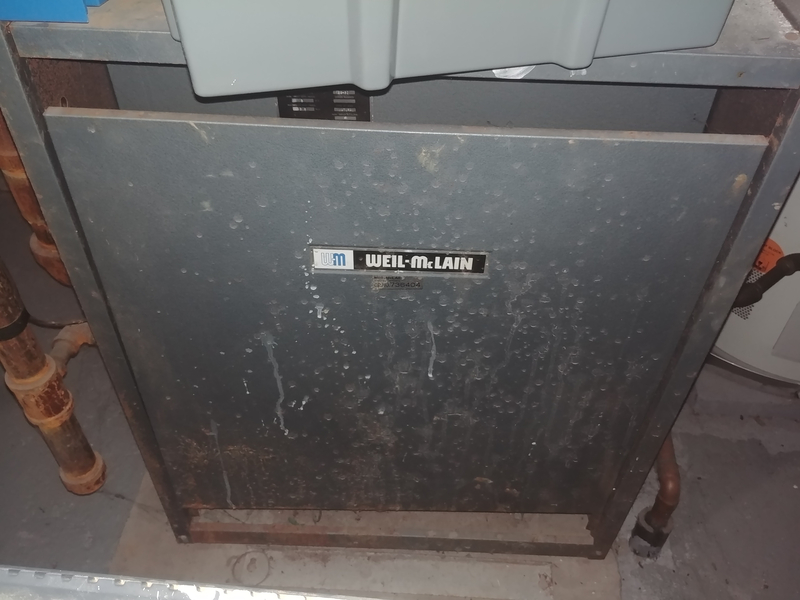 Here's a question: I'd like to avoid buying a new steam boiler this year, and then buying a new hot water boiler in 3-8 years when the current one dies (it's decades old; don't know how old exactly). 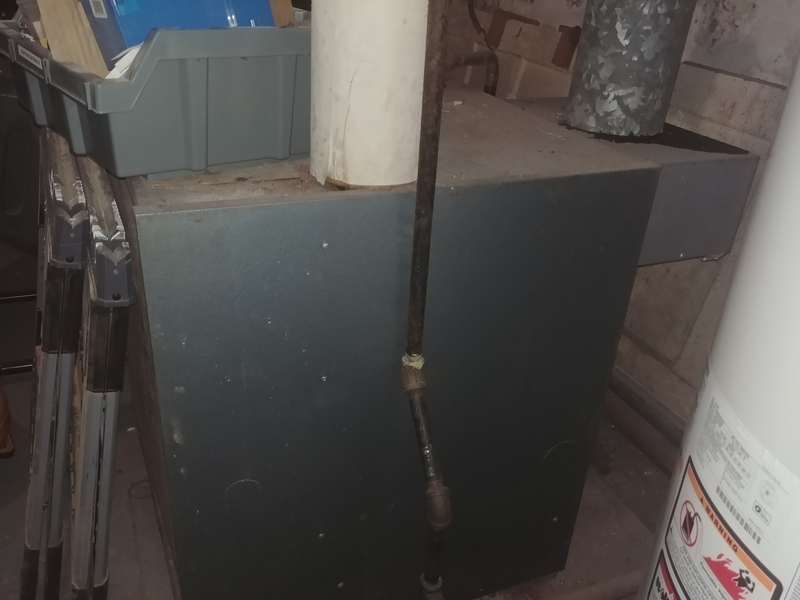 Could I buy a steam boiler and switch the entire home over on to it, including the parts currently on hot water? I guess my already large hot water radiators would then become YUGE steam radiators. But of course I can always adjust the valves if they're putting out too much heat right? So how many hot water radiators, and how many steam? Can you post pics of both? kind of hard to picture what you have going on. Hot water is primary heat now? 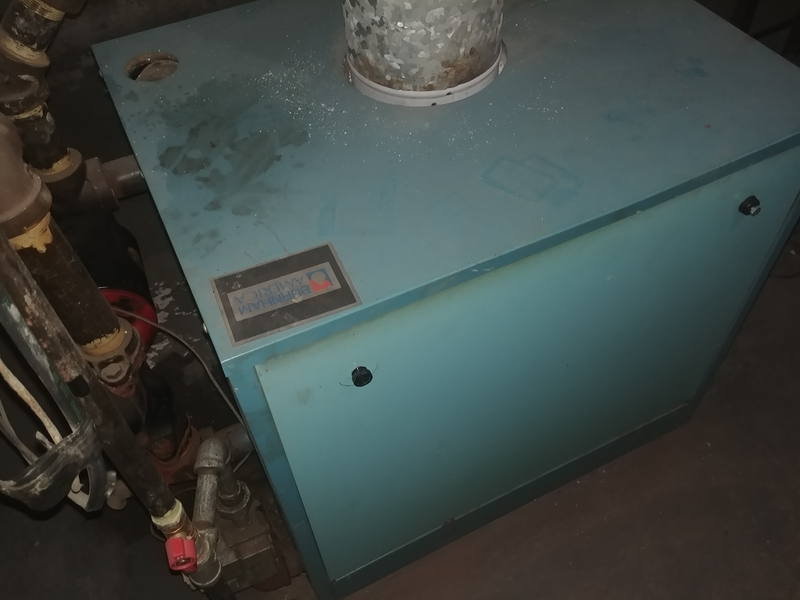 Steam boiler was, and some reminents of the steam rads still exist,and the steam is not functional. The hot water side appears to have always been hw (well: it's always been two pipes, at least). Same with the single pipe steam side. It's weird. Yes, hw is primary for most of the house (and it works great) other than the rooms on the heat pump (these were an addition- pre 1950s I think). The unheated rooms either aren't being used right now, or they stay warm enough to hang out with a blanket, or we're running space heaters (argh). 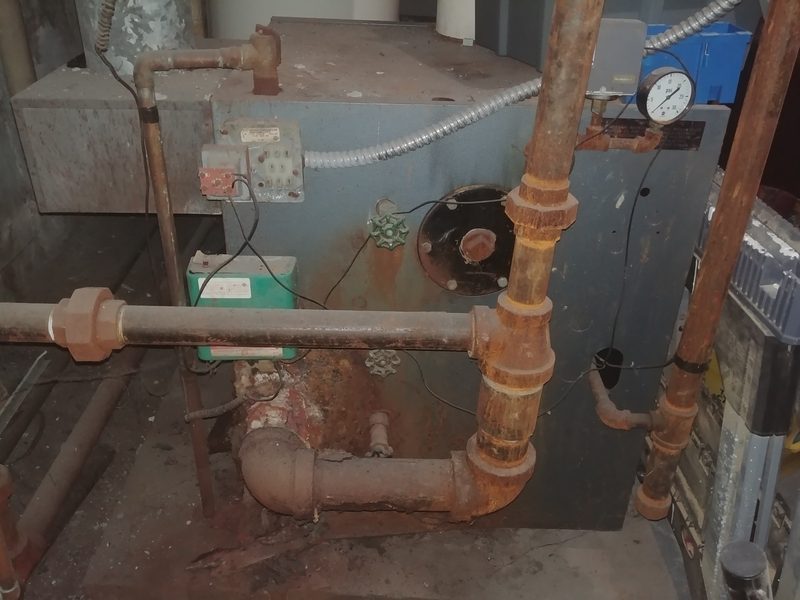 Some pictures attached of one of each type of radiator, the defunct steam boiler, and the hw boiler. Well....you have a functional water based boiler which how long it will last is unknown. Thank you so much for the advice. This makes me feel better about the long term plan I had. Though not about the price tag! I'm probably a couple years from being able to afford all of this phase. There is a natural gas line nearby one of the cold rooms. I'm thinking about putting in a "warm morning" gas space heater for the time being. That should be just as efficient as heating with hot water, should it not? What you need to do. Which is not that simple, is try to find someone that is proficient at hot water heating, AND steam heating. They need to look at your total system infrastructure on both sides, and determine which way would be easier, and cheaper to go. I recommend you try 3 different people to do the same thing so you get apples to apples comparisons. You yourself need to learn as much as you possibly can to both protect yourself, and be knowledgeable enough to understand the recommendations from those people. We can talk all day long about rads, heat loss, EDR , which system to go with all important stuff, but at the end of the discussion being onsite to view the piping, boilers, and controls that brings everything together needs to be seen to be able to make any kind of intelligent decision. The piping is a big one. What we do know is if you go with hot water you need to buy several radiators for hot water. I don’t know if you want same old stuff to keep the historical aspect, or not. Old rads are easy to find just have to be careful they have been tested.